This is a young version of Sam and Sarah, who spent lots of time on their bellies with a good book. It was my goal to instill an early love of letters, and both of them continue to be avid readers. I'd love to have this alphabet rug for my own home! And all those letters led to Alphabet Soup! Vintage chart with photo glued to cover. design size The Big Red, Well Read, Book 92 wide x 152 tall, Alphabet Soup 56 wide x 56 tall. All fabrics are from R&R Reproductions. The Big Red, Well Read, Book is stitched on 10 count Autumnal Haze Tula using Caron Collection Watercolours in Amethyst, Blush, Caramel, Cinnabar, Copper, Dark Shadows, Eggshell, Granite, Honeysuckle, Midnight, Morning Mist, Moss, Polar Ice, Rain Forest, Silver Blue, and Spice with JABC pack 5952. Frame is no longer available. Framed Alphabet Soup is stitched on 10 count Stott's Creme Soda Tula using Caron Collection Watercolours in Cinnabar, Copper, Spice, Midnight, Honeysuckle and Silver Blue. 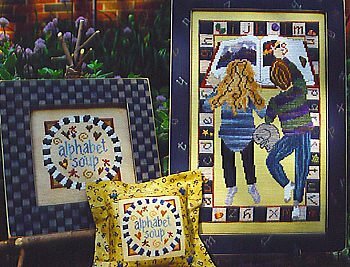 Alphabet Soup pillow is stitched on 28 count Antique Cotton using The Gentle Art Bluejay, Brandy, Midnight, Mulberry, Nutmeg, and Oatmeal. Pillow is an Olde Colonial Tuck-A-Way®.